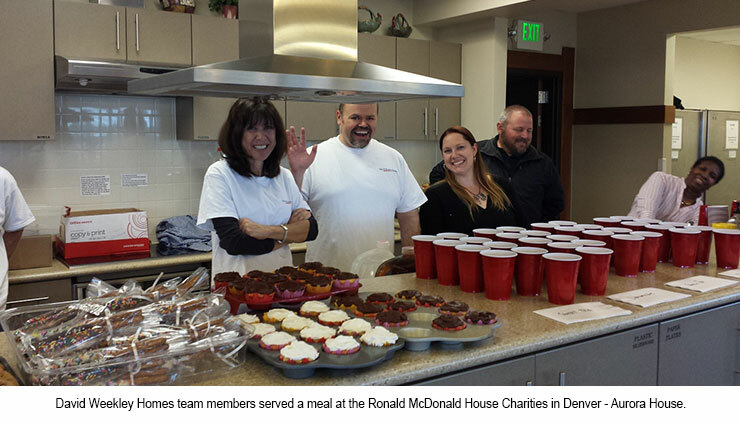 DENVER, CO (June 16, 2015): David Weekley Homes sponsored and served dinner at the Ronald McDonald House® Charities of Denver - Aurora House on May 21, with 14 area team members serving a meal to approximately 40 individuals staying at the facility. The Ronald McDonald House® Charities of Denver provides a home away from home to families with seriously ill or injured children who are receiving medical treatment at metropolitan area hospitals. David Weekley Homes strives to make a positive impact in all the communities it builds in. This is accomplished by company team members volunteering countless hours to different organizations in their communities and by the Weekley Family Foundation donating more than $100 million to a variety of organizations through the U.S. and abroad since 1976.